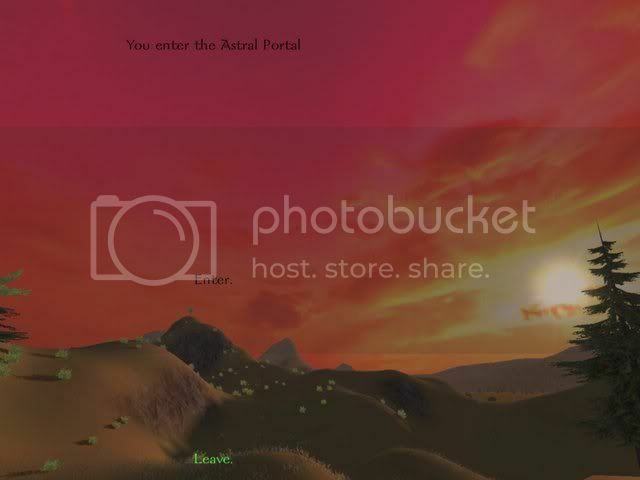 I downloaded it, it looks nice, so in the beginning, I go to Astral Portal. I then choose a path, and then I go do the training stuff (destroy 10 dummies), and then I get Tayyibah. After that, I find the doorways to places, so I go to Guardian's Abbey, and town centre, and stuff, and I have Durdana and nema in addition to Tayyibah. However, I can't leave the town at all. Every time I go to a leave town, it just says You have entered Astral Portal (enter), and enter is the only choice. I can't leave. I can't go to On or whatever. I can only stay in the one town, and Holy Ground only has portals to Holy Ground (itself), and Dreaming World. Oh, and I talked to that person in the middle of the flames in Dreaming World, and got a quest/helm from her. I still can't leave to hunt the Shadow Knights, though. how do you get out of the beginning, basically? the stuff that's posted didn't really help. As you said, the stuff that's posted didn't really help. You can only find help for 1.2.3. You stay captured in astral portal? I will check for you this problem. did you find LEAVE at the bottom of the page? ahahaa, thanks. I never look at the bottom.